At Shared Hope we are constantly reviewing the projects that we support. As at February 2017, we are involved in eighteen countries across three continents. 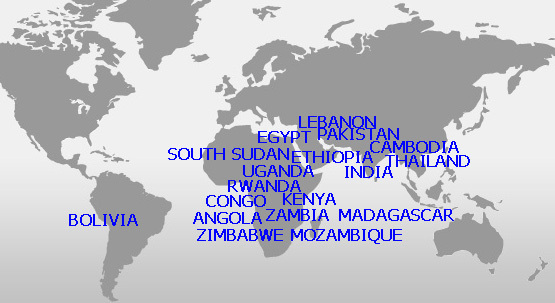 In Africa we are in partnership with projects in Angola, Congo, Egypt, Ethiopia, Kenya, Madagascar, Mozambique, Rwanda, South Sudan, Uganda, Zambia and Zimbabwe. In Asia we are working with projects in Cambodia, India, Lebanon, Pakistan and Thailand. In South America we are involved with a project in Bolivia. On this site you will be able to find out much more about the people, projects and places that we are supporting.